Audio programs jaywalking between Southern California and the entirety of human experience. Listen via iTunes Podcast. Or via Stitcher. Episode 008 Features: Cheri Mann, Brian Mann, Lori Mann Erenberg, Norman Panto, Gigi Rabe, and Ricardo Guzman. With the voices of Carolyn Bolli-Thompson and Curt Anderson. Additional Music by The Idiomatiques (feat. Brian Mann), Norman Panto, and Gee Rabe. A Westminster-branch Milton Man student who went into podcasting. Episode 009 Features: Lori Mann Erenberg, Gigi Rabe, Otoño Lujan, Ricardo Guzman, Lucho Campillo, Dylan Campillo, and Norman Panto. With Brian Mann. Additional music by the students of Otoño’s class at La Plaza de la Raza, The Mystic Knights of the Oingo Boingo, Gee Rabe, Conjunto Los Pochos, Very Be Careful, Lucho Campillo, and Norman Panto. Special thanks to Keren Albala, Tena Rubio, Danny Bringer, Dave and Veronika Caballero. From roughly the 1920’s to the ‘60s, the accordion with piano keys became one of the premiere musical instruments in the US. Countless accordion schools appeared across the country, including a handful which reached impressive size and included their own music publishing and lines of custom-manufactured accordions. To sustain themselves, especially as popularity started waning in the ‘60’s, they had to use aggressive sales and marketing techniques to keep growing their student base (and it was by selling new instruments to students that the studios made money). One of the biggest and one of the last in existence was the chain of Milton Mann Studios, based in Orange County but extending across much of Southern California. Part 1 is the story of the man behind the business and a broader look at why accordions fell in and then out of favor. 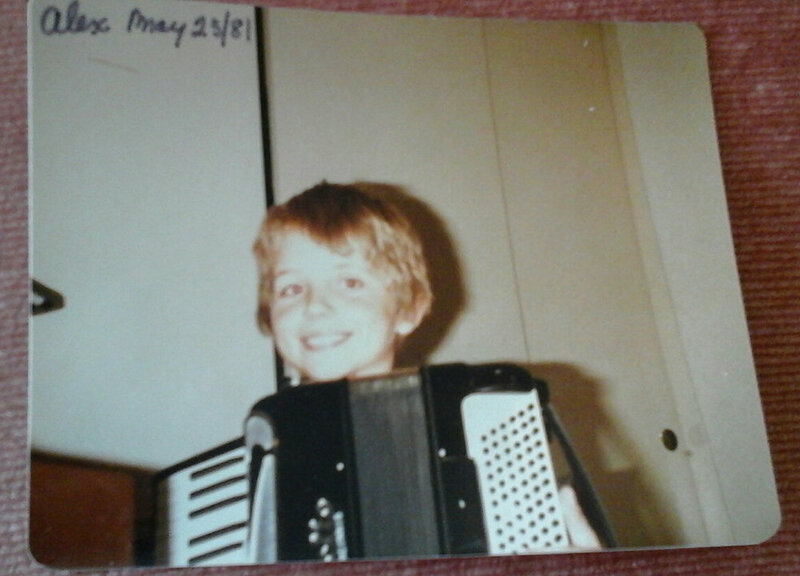 Part 2 is the story of what happened outside the world of the official piano accordion industry: how the instrument became cool again, how it fared in academia, how in the rest of the Americas the all-button version of the instrument was only getting increasingly popular and is now a huge presence in music throughout the Western Hemisphere. Including: how discovery of the joys of conjunto can strike like lightning; the art of accordion customizing in Colombia; why you shouldn’t stop at just one accordion; and how playing the accordion can lead to surprising places, including a spot on a Taco Bell ad. The site on North Broadway of the final accordion studio of Guido Deiro, the man who brought the piano accordion to the USA. Brian Mann performs gypsy jazz in the Santa Barbara-based ensemble The Idiomatiques. Hear L.A.'s Accordion Diva herself Gee Rabe (who also plays a mean steel drums). Interested in learning the button accordion? Otoño Lujan is the guy to talk to. For his conjunto work, check out Conjunto Los Pochos. Very Be Careful will get you dancing. See the spectacle of The Mystic Knights of the Oingo Boingo on the Gong Show. Are you a former Milton Mann student? If you aren’t aware of The Alumni of Milton Mann Accordion Studios page on The Facebooks, you should be. 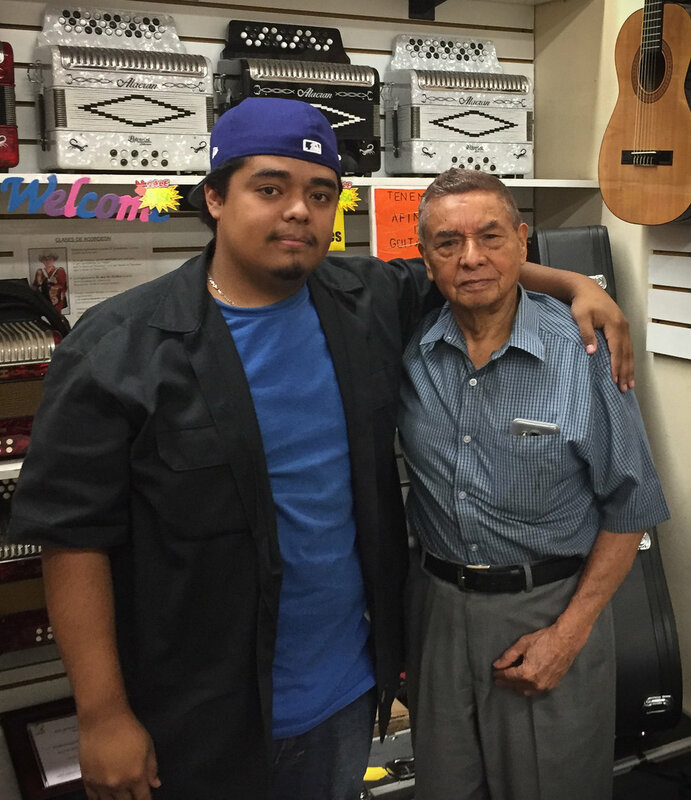 Dave’s Accordion Shop is a great place to purchase, study, or fix a piano accordion. If you need work done on your diatonic or chromatic button accordion, check out Taller Campillo at the Anaheim Marketplace (714.495.7116). If you have a Corona 3, I think Lucho would be especially excited to see you. For a quick peek at Alfredo Gutierrez playing accordion with his foot, jump to about 3:20. Norm Panto plays his father's button accordion. A wonderful book on the history of the piano accordion in the US is Marion Jacobson’s Squeeze This! A Cultural History of the Accordion in America. It includes a great look at the revival of the piano accordion in various contexts after the crash of the 70’s/80’s. It was a big inspiration for the structure of episode 008 and a source for some of the fun historical tidbits therein. The Golden Age of the Accordion is visually stunning and exhaustive in anecdotal history, with all the insights and limitations that brings. For capturing the printed ephemera and art deco glory of the accordion industry, it is undefeatable. It touches on much of the national scene, but is somewhat sad-making in its lingering San Francisco-centricity, which just makes one wish every accordion region had such an exhaustive document. The Accordion in the Americas: Klezmer, Polka, Tango, Zydeco, and More!, edited by Helena Simonett, is a great survey of all types of accordions in various contexts in North and South America, including chapters on vallenato (by Egberto Bermúdez) and conjunto (by Cathy Ragland) and the importance of accordions to Italian-Americans (Christine F. Zinni). Deborah Pacini Hernandez’s Oye Como Va! : Hybridity and Identity in Latino Popular Music provides a detailed, thoughtful history about the complexity of Latino music cross-pollinating across the Americas. Not enough accordions, but still fascinating. Los Secretos del Vallenato by Julio Cesar Oñate Martinez is a fun, sustained series of anecdotes and observations on the history of vallenato, for those looking for a deeper dive (in Spanish). A dissertation on the Irish accordion that includes some nice concise early history. Les Blanc’s Chulas Fronteras is (at the time of writing) watchable for free via Kanopy. It is also in the Library of Congress’ National Film Registry, as an official culturally- and historically-significant work. 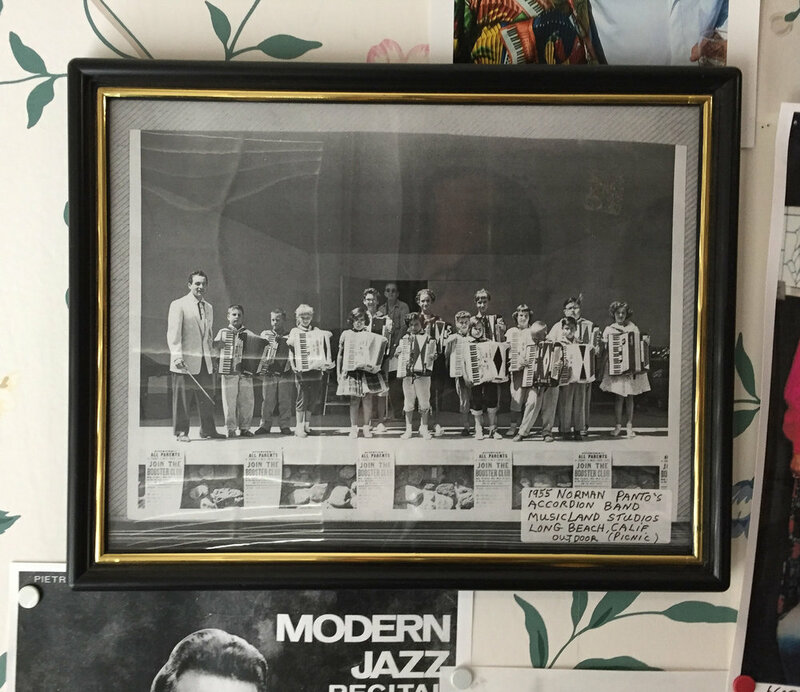 Mementos of Norman Panto's own music school, one of many chapters from his 70+year career playing music. Episode 007 - Featuring: Sam Anvari, Bob Bagha, Niloufar Talebi, and Bijan Tehrani. Two urban metropolises almost exactly opposite on the globe are each home to over 14 million people. Each sits at the southern foot of a mountain range, and is infamous for traffic, smog, and a hot, dry summer. Each entered their modern age in the 1770’s and came into their own with explosive growth in the 20th Century. Each has been enabled by impressive feats of aqueduct engineering. And one has become a nucleus of the other’s diaspora. The personal narratives of four people whose homes have included both Tehran and Southern California reveal glimpses of ever-shifting but consistently-lopsided cultural connections over almost 70 years of history. A taste of what it is to straddle societies, histories, and language. Especially when one of the cultures remains willfully oblivious of the other. Sam Anvari is a graphic designer with extensive online experience befitting someone who grew up in tandem with the internet. I met Sam at CSU Dominguez Hills, at an excellent showcase of Arabic and Iranian typographic art and design with connections to California. The show’s online component is: localnotlocal.com. Bob Bagha is a veteran DJ and owner of Streets Sounds. Once (perhaps someday again?) the brick-and-motor Street Sounds. For now, a moveable feast of DJ equipment, repair, and training. And if you are not familiar with Boney M's "Ma Baker", perhaps you should be. Niloufar Talebi is a writer, translator, and multidisciplinary artist whose work includes a cycle of Persian operas, most recently Abraham in Flames, about the life and work of Ahmad Shamlou. Her 2008 anthology of recent Iranian poetry produced outside Iran is Belonging. More about Forough Farrokhzad, the poet sometimes hastily contextualized in the West as "Iran's Sylvia Plath", is to be found lots of places, including here and here and here. Filmmaker and writer Bijan Tehrani is the founder and editor-in-chief of Cinema without Borders (English / Farsi). Issues of transliteration between alphabets haunt the internet, but glimpses of the wartime show Ali Kocholo can be found on You Tube. The Western visibility of the film Crazy Castle at least benefits from its having an official English title, even if there is a subsequent body of argument around the validity of that translation. In terms of cultural and political examinations of contemporary(-ish) Iran for a Western audience, Hooman Majd's The Ayatollah Begs to Differ is one of the best I've found. But 2008 was already a long time ago. One my personal favorite moments of Cal-Iranian culture outside the scope of this episode is also one of the best teen-vampire-romance films ever made, Ana Lily Amirpour's A Girl Walks Home Alone At Night. Set in Iran, shot in Taft, CA. Episodes 005 and 006 - Featuring: Joy Falk, Miguel Ordeñana, Ann Faison, and Jeremy Bailey. With Pooka Martinez, Rosalie Gelston, and Peter Martinez. Animal audio from the Macaulay Library at the Cornell Lab of Ornithology, originally recorded by: Donn Carr, William W. H. Gunn, Geoffrey A. Keller, Virgil J. Ketner, Bob McGuire, Theodore A. Parker III, Gustav Peters, Andrea L. Priori, Thomas G.Sander, Ronald Schassburger, Sara Waller, and R. Alan R. Zelley. The animals of the Southland: the ones we kill, the ones that live in our houses but are not pets, the ones we track with sophisticated surveillance equipment, the ones we sell, and the ones we pay money to see. Few regions on earth offer as ripe a mix of urban and wild ecosystems, overlaid and intermingled, from the mountains to the sea, every backyard interconnected. As droughts and fires push different pockets of animals into the city and suburbs, many are finding productive new homes among us. And as a human population that has largely given up rural pursuits, for the most part, we seem interested in seeing if there's some way to make this all work out. The first part (Episode 005) focuses on our direct interactions and history with our local carnivores, and the role of Griffith Park as an island of nature in the city, while the second part (Episode 006) traces two strands out from what happens once most of our local carnivores are killed or out of sight in the late 19th Century and we move away from our rural roots: deer discover their fondness for suburban living and thrive like never before, and we are free to embrace our fondness for importing new large predators to look at in zoos, movies, and all sorts of animal parks. Also: further demonstration of how Walt Disney ruined everything. Hearing Mike Davis present an early version of the "Maneaters of the Sierra Madre" chapter of Ecology of Fear was a formative moment many years ago, building on an existing fascination with urban wildlife since my late-teen years, and the moment I saw an opossum in an Irvine office park parking lot and had zero context for what I was witnessing. With all the wonder and uncomfortable confusion, I may as well have been seeing a dinosaur. Here's some on the National Park Service's mountain lion program and lots more, including a map of the animals they are studying, which has sadly needed several updates this year due to mortality. Their urban coyote tracking program offered a tantalizing glimpse of the new coyote lifestyle illustrated by C-144 before her collar died. And like a raccoon but unlike a mountain lion, good luck catching the same coyote twice. Perhaps my single favorite discovery while researching the episodes was this 1929 map of Los Angeles attractions. Thank you once again, LA Public Library. Arcadia Books has a nice publication on Jungleland by Jeffrey Wayne Maulhardt, featuring lots of fun photos and tales from the former Thousand Oaks landmark. A compilation of material on the Selig Zoo, including a focus on the architecture can be found here. The infamous LATimes interview with Jack Dutton, long after the fact. The LA history dynamo Nathan Masters has a wonderful article on the LA ostrich scene. The black bear relocation program is detailed in a LA Times article by Kate Mather. South Bay historian Sam Gnerre's rich, three-part history of Marineland from the Daily Breeze begins here. Animal Attractions: Nature on Display in American Zoos by Elizabeth Hansen has lots of great background on the development of US zoos, the industries around them, and the public fascination with wildlife capture in the early 1920's. Jeffrey Stanton's article on Barnes City. Lots of fun brochures, photos, flavor, and general errata from Japanese Village and Deer Park. Despite growing up down the street a few years after it closed, I only became even dimly aware of this place from a mysterious souvenir plate a friend found decades later and counties away in a thrift shop, with hand-painted cartoons suggesting a fantastic alternate world where a lush establishment in Buena Park was home to dancing dolphins and a free-throw shooting bear. Turns out it was real. The interview with Joy Falk was conducted in 2011. She has since retired from the Laguna Beach Police Force and is happily working part-time as a horse trainer. Miguel Ordeñana is a biologist and educator at the Natural History Museum of Los Angeles County and has been involved with a photographically-rich variety of field studies (pumas and jaguars in Nicaragua, bats, bobcats) and a plethora of the museum's "Citizen Science" projects documenting urban wildlife (get involved! discover new species in your backyard! There's something for everyone: squirrels to spiders.). Ann Faison is an artist, writer, healer, and wildlife enthusiast. Jeremy Bailey runs Animal Capture Wildlife Control and was very helpful in removing a large, dead raccoon from under our kitchen. Episode 004 - Featuring: Jim Connolly, Eric Newton, Gene Cajayon, Devon Tsuno, Kate Conklin, David J. Williams, Giuliano Fuimani, Hovsep Fidanian, and Steve Gilford. De-tuned piano prepared and played by Jim Connolly. An essay on personal and collective responsibility in a time of shifting economic sands and elusive safety nets, focusing on one of Los Angeles' great economic engines: creativity. Aerialists, singers, musicians, visual artists, science fiction writers, film directors, and physical special effects specialists are herein represented in the quest for a healthy professional life. Woven through the stories of these small business owners and entrepreneurs is the history of California's contributions to the development of health insurance in the US. Risk comes in many forms; managing it demands many strategies. Are freelance artists the coal mine canaries for a large portion of our economy? Embrace the uncertain, accept the pain, and pick up some ideas about what to wear to the upcoming semi-formal economy. Steve Gilford is the author of Build 'Em by the Mile, Cut 'Em Off by the Yard: How Henry J. Kaiser and the Rosies Helped Win World War II. Jill Lepore's New Yorker article on Whitaker and Baxter was a great resource on the media-wary media professionals, especially their history with Earl Warren. Of course, as with so many things, Carey McWilliams was early on the scene with a three-part series on them in The Nation which ran in 1951. Gerard W. Boychuk's National Health Insurance in the United States and Canada: Race, Territory, and the Roots of Difference makes the case that racism in the US has been an overlooked factor working against the country's attempts toward a broad public health insurance system. Jim Connolly performs as Toy Shop Ghost (among many other incarnations), and is a piano technician based in Santa Barbara, whose live scores for Lit Moon Theater were an inspiration for some of the sound design approaches of this podcast; Eric Newton is part of Kinetic Theory Circus and Theater Arts in Culver City ; Gene Cajayon's first feature, The Debut, is available online at Amazon, iTunes, and Vudu, for DVD purchase, and as a DVD rental at select supermarket locations in South Orange County; since recording his interview, Devon Tsuno has started as full-time art faculty at CSU Dominguez Hills; more about the un-summarizeable Kate Conklin here; David J. Williams is the author of the Autumn Rain Trilogy and a shaper of the Star Wars universe; Giuliano Fuimani has brought to life things like an ethereal ping pong ball running shoe and giant flag installation art and a fire/water otherworld, in addition to all the usual special effects stuff. Southern California ain't what it used to be in terms of aircraft production, but it's still working hard to increase our access to space. This episode explores the privatization of outer space through the lens of Mojave, the small desert town with an oversized spaceport, and on the government front, the continuing work of the Jet Propulsion Laboratory in Pasadena. Public or private, manned or robotic, ventures in space don't come easy. An earlier, related episode (#001) looks at the 20th century history of aerospace in the Los Angeles basin, 1910 to the post-Cold War years, and how the growth of the industry was inseparable from the growth of the region itself. Episode 003 - Featuring: Jens Jonason, Doug Messier, Cathy Hansen, Bill Deaver, William Mathews, Daniel Wenkert. With Genevieve Anderson, Jason Brown, Joyce Brott. Audio clip courtesy of Mojave Air/Space Port. One of the best sources for all the latest everything in the business of space: Doug Messier's excellent blog, Parabolic Arc. To see classic planes amidst the not-so-easy to see cutting-edge rocket and spaceplane R&D at Mojave (plus an interesting guest speaker), Plane Crazy Saturdays offers monthly opportunities. Put on by the Mojave Transportation Museum, which has no permanent public home yet, apart from its website. If you find yourself in Mojave for breakfast or lunch, the diner right on the flight line, Voyager Restaurant, is highly recommended, especially the nopalitos scramble. Episode 002 - Featuring: Mark Siegel, Lily Siegel, and Miranda Siegel. With music by Mark Siegel. Additional recording by Lauren M. Whaley. The very personal story of the Siegel family. A tale of the difficulty of communication between loved ones at life's heaviest and important moments. With glimpses of late-60's, '70's, and '80's Los Angeles, and the not-as-heavy Antonioni movie set in Southern California. Episode 001 - Featuring: Jens Jonason, Jason Brown, Joyce Brott, Ken Brott, William Mathews, and Daniel Wenkert. With Genevieve Anderson, Cathy Hansen, and Bill Deaver. Recitations by Sophie Dufresne. Audio clips courtesy of the amazing NASA public archive. While not one of the original sites of flight invention, it took only a few years for Southern California to become THE place to be if you wanted to design and develop aircraft. While it feels hyperbolic and unquantifiable to say that the Southland was the single most important location in the history of aviation, it's probably true. Not that most people outside the industry are even dimly aware of that connection. This episode tracks the shift from ragged, entrepreneurial enthusiasts to the industrialized complex that eventually led to the moon and back and the subsequent disappearance and erasure of the industry from the region. Part 2 (episode 003) will follow the post-Cold War developments north into the desert of the Antelope Valley and up, into orbit and beyond. Airplane sound from the Los Angeles County Air Show at the historic Fox Field in Lancaster. Abandoned and Little-Known Airfields, a website devoted to the specific histories of the nation's airfields, eloquently capturing the explosion of small fields in the first three decades of powered flight, and the contraction and consolidation since then. the mind of Jason Brown, whose dark corners meet only in non-Euclidian geometry. Click below for a gallery of photos of the brief moment in time that was Downey Studios, Home of the Space Shuttle. One of the countless intersections between Los Angeles' aerospace and film histories. Photos taken in 2004.